Jerusalem (Hebrew: יְרוּשָׁלַיִם , Yerushaláyim or Yerushalaim; Moslem Arabic: القُدس , al-Quds ("the Holy"), Christian Arabic اورشليم Ûrshalîm; official Arabic in Israel: اورشليم القدس, Urshalim-al-Quds (combining the Biblical and common usage Arabic names) is the capital and largest city of the State of Israel with a population of 724,000 (as of May 24, 2006) contained in 123 km². An ancient Middle Eastern city on the watershed between the Mediterranean Sea and the Dead Sea at an elevation of 650-840 metres (about 2000-2500 feet), Jerusalem is located southeast of Tel Aviv, south of Ramallah, west of Jericho and north of Bethlehem. Jerusalem is the holiest city of Judaism (since the 10th century BCE) and some denominations of Christianity (since the 5th century CE). Jewish law holds that the more important Jewish prayers should be conducted facing the direction of the city, specifically in the direction of the Temple Mount. Jerusalem is generally regarded by Muslims as the location of the third holiest site in Islam, and the city was the original Qibla (direction of prayer) for Muslims prior to Mecca. Jerusalem appears in the Hebrew Bible 669 times while Zion (which usually means Jerusalem, sometimes the Land of Israel) appears 154 times. The New Testament mentions Jerusalem 154 times and Zion 7 times. A heterogeneous city, Jerusalem represents a wide range of national, religious, and socioeconomic groups. The section called the "Old City" (barely 1 km²) is surrounded by walls and consists of four quarters: Armenian, Christian, Jewish, and Muslim. The "Old City" was named by the American television show Good Morning America and newspaper USA Today as one of the "New Seven Wonders of the World" in 2006. The status of united Jerusalem as Israel's capital is not universally recognised by the international community, and Israel's annexation of East Jerusalem is particularly controversial. East Jerusalem, if not all of Jerusalem, is claimed by Palestinians as the desired capital for a future Palestinian state. The current Israeli mayor of Jerusalem is Uri Lupolianski, the first Haredi Jew to ever hold this position. A view of the Old City of Jerusalem taken from the Jewish Cemetery on the Mount of Olives. The origin of the name of the city is uncertain. It is possible to understand the name (Hebrew Yerushalayim) as either "Heritage of Salem" or "Heritage of Peace" – a contraction of "heritage" (yerusha) and either Salem (Shalem literally "whole" or "in harmony") or shalom ("peace"). (See the Biblical commentator Nachmanides for explanation.) "Shalem" is the name used in Genesis 14:18 for the city. Similarly the Amarna Letters call the city Urušalim in Akkadian, a cognate of the Hebrew Ir Shalem ("city of Salem"). Some consider a connection between the name and Shalim - the deity personifying dusk known from Ugaritic myths and offering lists. The ending -ayim or -im has the appearance of the Hebrew dual or pluralis. It has been argued that it is a dual form representing the fact that the city lies on two hills however the treatment of the ending as a suffix makes the rest of the name incomprehensible in Hebrew. A Midrashic interpretation comes from Genesis Rabba, which explains that Abraham came to "Shalem" after rescuing Lot. Upon arrival, he asked the king and high priest Melchizedek to bless him, and Melchizedek did so in the name of the Supreme God (indicating that he, like Abraham, was a monotheist). According to exegetes, God immortalizes this encounter between Melchizedek and Abraham by renaming the city in honour of them: the name "Yeru" (derived from "Yireh", the name Abraham gives to Mount Moriah after unbinding Isaac, and explained in Genesis as meaning that God will be revealed there) is placed in front of "Shalem". The plural ending implies the community of all believers in the One God who testify to the city's holiness. Archaeological findings indicate the existence of a settlement in Jerusalem in the 3rd millennium BCE. The earliest written record of the city to Egyptian records of the Bronze Age in the 2nd millennium BCE. The city is believed to have been first built and founded by Canaanite peoples (possibly, but not necessarily the Jebusites who occupied the city during the late Bronze Age). During this Canaanite period, Jerusalem had the name Urušalim, meaning "the city of peace". From about 1600 to 1300 BCE, the city came under Egyptian suzerainty and was governed by Canaanite rulers who paid tribute to the Pharaohs. During this period, the city increasingly came under attacks from the Habiru. According to Midrash, Jerusalem was founded by Shem and Eber, ancestors of Abraham. 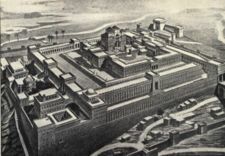 Further, the Bible mentions that the city was controlled by the Jebusites until its conquest by David, at a date subsequently placed at about 1000 BCE. David expanded the city to the south, and declared it the capital city of the united Kingdom of Israel. It thus became the capital of the Jewish kingdoms of Israel, Judah and Judea in the First Temple and Second Temple periods. In about 960 BCE, Solomon built the First Jewish Temple. For about four centuries after the ten tribes split off to form the northern Kingdom of Israel, Jerusalem served as the capital of the southern Kingdom of Judah. By the end of the First Temple period, Jerusalem was the sole acting religious shrine in the kingdom, and a centre of regular pilgrimage. Historical records corroborate some of the Biblical history from around the 9th century BCE, and attest the significance of the Temple in Jewish religious life. 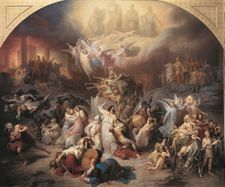 In 597 BCE, the city was overcome by the Babylonians under Nebuchadrezzar, and in 586 BCE, the city's walls were ruined and the Temple was burnt. After several decades of captivity, the Jews were allowed by Cyrus II of Persia to return to Judah and rebuild the city and the Temple. It continued to be the capital of Judah and centre of Jewish worship for another four centuries under the Hasmonean Kingdom. By 19 BCE, the Temple Mount was elevated and the Second Temple was expanded under Herod the Great, a Jewish client king under Roman rule. In 6 CE, the city and Iudaea Province came under direct Roman rule. The Great Jewish Revolt resulted in the destruction of the Second Temple in 70 CE. The city served as the national capital again for almost 3 years during the Bar Kokhba's revolt against Rome; it was sacked in 135 CE. 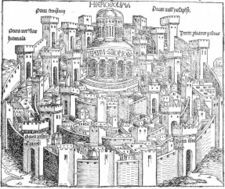 For almost two millennia thereafter, Jerusalem did not serve as the national capital of any independent state, until the renewed independence of Israel in 1948. The city remained under Roman and Byzantine rule, until it was taken by the advancing Muslim forces in 638. The rights of the non-Muslims under Islam were governed by the Pact of Umar, and Christians and Jews living in the city were granted autonomy in exchange for a required poll tax. Whereas the Byzantine Christian authorities had not tolerated the presence of Jews within the walls of the city, the Muslim rulers allowed the reestablishment of a Jewish community. After the treaty of Capitulation signed with the Byzantines, Umar ordered the Patriarch Sophronius to guide him and those who accompanied him to the sanctuary of King David, where he later decided to build a mosque in front of the Rock. The mosque became known as Masjid Umar. 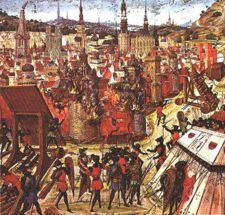 In 1099, the city was conquered by the First Crusaders, who slaughtered most of its Muslim and Jewish inhabitants. A series of conquests followed: in 1187 the city was taken from the Crusaders by Saladin. From 1228 to 1244, it was given by Saladin's descendant al-Kamil to the Holy Roman Emperor Frederick II. Jerusalem fell again to the Ayyubids of Egypt in 1244. The Ayyubids were replaced in 1260 by the Mamelukes, and in 1517, Jerusalem and its environs fell to the Ottoman Turks. In 1917, the British Army led by General Allenby captured the city. Under the League of Nations Mandate, Britain was entrusted with establishing a Jewish National Home in Palestine. This period saw the construction of new garden suburbs in the western part of the city and establishment of institutions of learning such as the Hebrew University, founded in 1925. As the British Mandate of Palestine was expiring, the 1947 UN Partition Plan (Part III) recommended that "The City of Jerusalem shall be established as a corpus separatum under a special international regime and shall be administered by the United Nations." However, this plan was never implemented and at the end of the 1948-49 war, Jerusalem found itself divided between Israel and Jordan (then known as Transjordan). The 1949 cease-fire line between Israel and Jordan, which was part of the Green Line, cut through the centre of the city from 1949 until 1967, during which time west Jerusalem was part of Israel and East Jerusalem was part of Jordan. From 1950 to 1967, the capital declared by Israel was comprised of western Jerusalem. Ever since Israel captured eastern Jerusalem from Jordan in the 1967 Six-Day War, Israel has administered and asserted sovereignty over the entire city. Israel's 1980 Basic Law: Jerusalem, Capital of Israel declared Jerusalem to be the 'eternal, undivided' capital of Israel, while East Jerusalem is being claimed as the intended capital of a future Palestinian state. The status of the city and of its holy places is disputed. Jerusalem plays an important role in three major religions: Judaism, Christianity, and Islam, as well as in a number of smaller religious groups. A large number of places have religious significance for these religions, among which the Temple Mount and its Western Wall for Jews, the Church of the Holy Sepulchre for Christians and the Al-Aqsa Mosque and Dome of the Rock for Muslims. Israel proclaimed Jerusalem as its capital in 1950 and all the branches of Israeli government (Presidential, Legislative, Judicial and Administrative) are seated in Jerusalem. In 1950, given that the city was divided between Israel and Jordan, this proclamation related only to western Jerusalem. Immediately after the Six Day War in 1967, Israeli legislation incorporated East Jerusalem into Israel, annexing it to the municipality of Jerusalem, and making it a de facto part of its capital. Israel enshrined the status of united Jerusalem, west and east, as its undivided capital, in Israel's 1980 Basic Law: Jerusalem, Capital of Israel. United Nations Security Council Resolution 478 declared that this law was 'null and void and must be rescinded forthwith' and advised member states to withdraw their diplomatic representation from the city as a punitive measure, which most of the few countries with embassies in Jerusalem did, relocating their embassies to Tel Aviv. Most UN member states already located their embassy in Tel Aviv prior to Resolution 478. Currently, only two UN member states have located their embassies within the city limits of Jerusalem, Costa Rica and El Salvador, with the embassies of Bolivia and Paraguay to be found in Mevasseret Zion, a suburb of Jerusalem. On August 16, 2006, the newly elected Costa Rican president stated the intention to relocate its embassy to Tel Aviv. Nine days later, El Salvador followed with a similar statement. Jerusalem is home to a number of key Israeli government buildings, including the Knesset, the Israeli Supreme Court and the houses of the President and Prime Minister. With the exception of the house of the premier, these buildings can be toured. Much of the international community argues that Israel's annexation of the eastern part of Jerusalem after the Six-Day War was in violation of international law, and that the final issue of the status of East Jerusalem should be determined in future Israeli-Palestinian negotiations. Therefore, although all ambassadors and other official diplomats submit their accreditation to the President of Israel in his house at Jerusalem, nearly all countries maintain their embassies in Tel Aviv, Israel's economic and financial centre. The Palestinian National Authority asserts that the capital of a future Palestinian state will be situated in East Jerusalem. According to the Oslo Agreements the final status of Jerusalem should be determined by peaceful negotiation. The most notable "official" Palestinian presence in the city is the Orient House, which has been subject to strict monitoring by the Israeli authorities and since August 2001 has been occupied by the Israeli security services. The Palestinian flag has since been taken down from it. The Palestinian National Authority also regards East Jerusalem as the provincial capital of its Jerusalem Governorate (محافظة القدس). Jerusalem is situated in 31°46′45″N, 35°13′25″E, upon the southern spur of a plateau the eastern side of which slopes from 2,460 ft. above sea-level north of the Temple Mount to 2,130 ft. at the southeastern extremity. The western hill is about 2,500 ft. high and slopes southeast from the Judean plateau. Jerusalem is surrounded upon all sides by valleys, of which those on the north are less pronounced than those on the other three sides. The principal two valleys start northwest of the present city. The first runs eastward with a slight southerly bend (the present Wadi al-Joz), then, deflecting directly south, the Kidron (Hebrew) Valley or Wadi Sitti Maryam (Arabic), divides the Mount of Olives from the city. The second runs directly south on the western side of the city, turns eastward at its southeastern extremity, then runs directly east, and joins the first valley near Bir Ayyub ("Job's Well"). This valley is called the Valley of Hinnom or Ge-Hinnom in Hebrew, and Wadi al-Rababi in Arabic. A third valley, commencing in the northwest where the Damascus Gate is now, ran south-southeasterly down to the Pool of Siloam, and divided the lower part into two hills (the lower and the upper cities of Josephus). This is probably the later Tyropoeon ("Cheese-makers'") valley. A fourth valley led from the western hill (near the present Jaffa Gate) over to the Temple area: it is represented in modern Jerusalem by David Street. A fifth cut the eastern hill into a northern and a southern part. Later Jerusalem was thus built upon four spurs. Today, neighboring towns are Bethlehem and Beit Jala at the southern city border, Abu Dis and Ma'ale Adummim to the East, Mevaseret Zion to the West, Giv'at Ze'ev to the North. Jerusalem is situated at a relatively high altitude and experiences cold, wet winters with an average of 9 °C. The average annual precipitation is about 600 mm (24 inches). Snowfalls, when they occur, are generally mild. Summers in Jerusalem are dry and often hot with temperatures averaging around 26 °C. There is almost no industrial pollution in Jerusalem. Most pollutants are the product of heavy bus and personal vehicle traffic, especially along the arterial roads, and a by-product from heavy building. With this exception, air pollution is low. The building code in Jerusalem prescribes that all buildings should be covered with native Jerusalem stone. Although this increases building costs somewhat, it gives the city a very distinct look in comparison with other cities. Since the 1950s only a small number of buildings have been constructed in Jerusalem which do not conform to this code. With the exception of the central plateau, many neighborhoods are divided by deep valleys, which are the natural green areas of the city. To the west of the city is the larger Jerusalem Forest. Especially in open spaces near major roads, large parks were developed. To the east and the southeast of the Old City, where little grows without constant irrigation, promenades with parks were developed, which allow walkers to enjoy the view of the Old City, the Judean Desert, the irrigated vegetation, and - depending on location and weather conditions - the Dead Sea and Jordanian mountains. When it first appears in historical records, Jerusalem was inhabited by a Canaanite tribe. The Bible specifies them as the Jebusites, and says they ruled it until its conquest by King David. After taking control of the city from the Canaanites, Jews formed the majority of the population for 1,200 years, until Jerusalem's destruction by Rome in the second century. Subsequent demographic changes are uncertain, although the city's population probably attained a Muslim majority by the time of the Crusades. An official 16th century survey confirms that the city was largely Muslim. By 1844, Jews were once again the largest single ethnic group in the city and formed a majority by the late 19th century. As of May 24, 2006, Jerusalem's population is 724,000 (about 10% of the total population of Israel), of which 65.0% were Jews (approx. one-quarter of whom live in East Jerusalem), 32.0% Muslim (almost all of whom live in East Jerusalem) and 2% Christian. 35% of the city's population were children under age of 15. In 2005, the city had 18,600 newborns. It should be noted that these official Israeli statistics refer to the expanded Israel municipality of Jerusalem. This includes not only the area of the pre-1967 Israeli and Jordanian municipalities, but also outlying Palestinian villages and neighbourhoods to the north-east of the city which were not part of the Jordanian municipality of East Jerusalem prior to 1967. A reasonable assumption is that all or part of these may not remain part of Jerusalem when its final status is established, but rather be returned to the West Bank as part of the Palestinian state. Some of these villages and neighbourhoods have already been returned to the West Bank de facto by way of the Israeli West Bank barrier, although formally, their legal status has not been reverted. Jerusalem houses many museums. The Israel Museum is one of the most famous. It includes a large collection of art and archaeological artifacts. In the "Shrine of the Book", it exhibits the Dead Sea Scrolls. The Rockefeller Museum is the city's specific museum for archeology. The Ticho House exhibits art collections in an historical building. The Tower of David Museum is the main municipal museum; it includes models of the city and changing exhibits. Yad Vashem is the national Holocaust museum and monument. The Islamic Museum in the Old City and Islamic Art Museum near the President's house both have collections of Islamic art, holy scripts and artifacts. The city has two professional orchestras, the Jerusalem Symphony Orchestra-IBA and the Israel Camerata Jerusalem. In walking distance from the old city (southwest) is a cluster of cultural institutions. Theaters include the Khan Theatre, Jerar Bachar, Beit Shmuel, Beit Agron and Jerusalem's Theatre. The Jerusalem Cinematheque is the venue in Jerusalem to watch non-commercial movies. It houses annually an international film festival and a Jewish film festival. In the Sultan Pool open air concerts are held, by Israeli artists and guests from abroad. The Jerusalem Music Centre in Mishkenot Sha’ananim hosts chamber music concerts and workshops. Adjacent to the Hebrew University’s Givat Ram campus are the Jerusalem Botanical Gardens. The Givat Ram campus is also the home to the Jewish National and University Library, itself home to the Albert Einstein archives and the Eran Laor Cartographic Collection. The Synagogue of the Hadassah Medical Centre is home to the Marc Chagall stained glass windows depicting the Twelve Tribes of Israel. Another theatre, the Palestinian National Theatre is located next to Orient House. The main cultural event of the year is the Israel Festival, with international and local street performances and repertory and alternative musicians and theatre groups. Heavy industry is discouraged in Jerusalem, leaving Jerusalem's economy as mainly service-based. While Tel Aviv remains Israel's financial capital, almost half of Jerusalem's residents work in government, public service, or tourism, although there has been an increasing number of high-technology start-ups in the city, as well. The civilian labor force of Jerusalem was 183,000 (48.1%) out of 384,000 persons ages 15+. This is low in comparison to Tel Aviv and Haifa, 58.0% and 52.4% respectively. This reflects a higher percentage of one income households, especially among the Arab and Haredi populations. According to the Israel Central Bureau of Statistics, the average wage for a Jerusalem worker was NIS 5,568 in 2000. In Tel Aviv the income was 17.8% higher and in Haifa 14.1% higher. Income in Jerusalem was on average lower both for wage-earners and self-employed people. The population of Jerusalem is poorer in comparison to Israeli national figures. This is also often attributed to large Arab and Haredi population segments. In 1995 25% of the city population and 37% of its children lived below poverty level, as compared to 17% of all Israelis and 23% of Israeli children. Begin Boulevard is western Jerusalem's inner city expressway. It runs south to north from Manahat (Malha) to Ramot, where it merges into the Modi'in-Tel Aviv highway ( Highway 443). Other major north-south arteries include: the Talpiot- Atarot route ( Route 60), which traverses the city centre and roughly separates East and West Jerusalem; and Herzl Boulevard, which begins at the northern entrance of the city and continues south via Mount Herzl and the Yad VaShem Holocaust memorial. It then merges into additional routes that lead to the southwestern quarters. The Golomb-Herzog-Ben-Zvi route also links the southern quarters with the city centre. Running east through the city centre, Jaffa Road connects the Jaffa Gate of the Old City as well as East Jerusalem with the northwestern city entrance and Highway 1. Yigal Yadin Boulevard serves as a northern bypass of the city centre, and links Ma'ale Adummim and the northeastern neighborhoods to Begin Boulevard near Ramot. A future ring-road would include Yadin and Begin boulevards as the respective north and west sectors. Jerusalem Central Bus Station is Jerusalem's intercity bus station. It is served mainly by Egged buses and by a single joint Egged - Dan bus line, while Superbus and Margalit, serving Modi'in, have their stops close by. City buses in the Jewish and Israeli areas are run by Egged, which runs close to 100 bus lines throughout the city and its suburbs. Palestinian-run buses serve the city's Arab neighborhoods as well as Palestinian towns in the West Bank and Israeli Arab towns. This system is based out of the East Jerusalem Central Bus Station on Sultan Suleiman Street, though buses also leave from outside the Damascus Gate of the Old City. The Egged and Palestinian city bus networks are almost completely separated. There are only a handful of bus stops that both companies serve. Arab residents of Jerusalem do use Egged buses frequently, but Jewish residents rarely use the Palestinian buses, in part because while Arabs do regularly visit the Israeli centre of town, Jews do not frequently come to the Arab parts of the city. Israel Railways operates train service to Southern Jerusalem with 2 stops: Jerusalem Malha near the Malha Mall and the Biblical Zoo. Very few trains stop at the latter stop. The line was out of use for seven years because of deteriorating conditions and was restored on April 9, 2005. Jerusalem Malha is a new station which replaces the historical Khan Station at Remez Square near the Old City. The train ride from Tel Aviv to Jerusalem takes about 80 minutes. The existing rail line serving Jerusalem began operating in 1892. A brand new high-speed electrified rail link is currently under construction, which will run from Tel Aviv to Jerusalem via Ben Gurion Airport and terminate at a new underground station - Binyanei HaUmah, located between the Jerusalem Central Bus Station and the International Convention Centre. It is anticipated that the new rail link will open in 2011, with an expected transit time from Tel Aviv of less than 30 minutes. A local light rail network is being planned and has already been partially constructed. 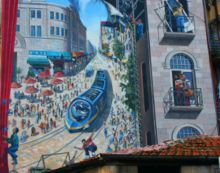 The first line is at the height of its construction and is slated to begin operating from Pisgat Ze'ev in the northeast through the French Hill and through Yaffo Street to the Central Bus Station and the southwestern neighborhoods around 2008. Unusually, for a city with a population of over 700,000, Jerusalem never had a previous first generation tramway network, although, before the war, one was proposed but was cancelled for political reasons. Atarot Airport is Jerusalem's airport, but was closed to civilian traffic in 2000 due to security concerns arising from the Al-Aqsa Intifada, and was later placed under IDF control during 2001. Ben Gurion International Airport, 40 km northwest of the city, serves as the primary international air transport hub for both Jerusalem and Tel Aviv. The most popular sport in Jerusalem is football (soccer). The city has two major teams, the yellow Beitar Jerusalem FC and the red Hapoel Jerusalem FC. Beitar plays in the Premier League, was 4 times Israeli champion (1986, 1993, 1997 and 1998) and has won the national cup 5 times. Hapoel currently plays in the Leumit or second league and has won one national cup, in 1973. In basketball, however, Hapoel Jerusalem has the upperhand. In a league dominated by Maccabi Tel Aviv it never won a championship, yet twice won the Israeli Cup, in 1996 and 1997. In 2004 it won the European ULEB Cup. A marathon is held in the streets of Jerusalem every year and the popular Jerusalem hike starts west of the city and ends in its streets. The municipality, universities, schools, clubs and businesses operate over a thousand sport facilities throughout the city. 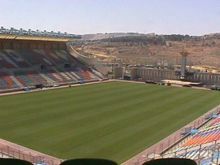 The largest sports facility is the Teddy Kollek Stadium in Malha, a football stadium with 21,000 seats. Major basketball games are held at the Strauss Arena.